Larry Blank conducts the BBC Concert Orchestra and a host of musical theatre stars in a concert celebrating the work of legendary lyricist Alan J Lerner in his centenary year. 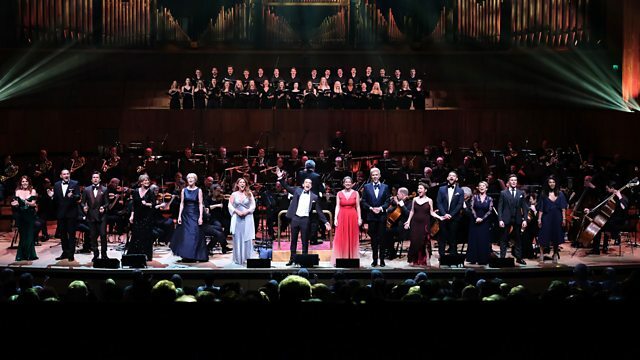 Broadway maestro Larry Blank conducts the BBC Concert Orchestra and a host of stars in a celebration of the genius of musical theatre lyricist Alan J Lerner in his centenary year. The concert features many of his best known songs from shows including My Fair Lady, Gigi, Brigadoon and Camelot as well some little-known gems, with music by Frederick Loewe, Burton Lane, John Barry, Charles Strouse and Leonard Bernstein. Hosts: Samantha Bond & Jamie Lambert. Orchestra: BBC Concert Orchestra. Conductor: Larry Blank. Orchestra: BBC Concert Orchestra. Conductor: Larry Blank. Singer: Ben Forster. Orchestra: BBC Concert Orchestra. Conductor: Larry Blank. Singer: Charlotte Page. Orchestra: BBC Concert Orchestra. Conductor: Larry Blank. Singer: Rob Houchen. Orchestra: BBC Concert Orchestra. Conductor: Larry Blank. Choir: Guildford School of Acting Choir. Singer: Rachel Tucker. Singer: David Bedella. Orchestra: BBC Concert Orchestra. Conductor: Larry Blank. Performer: Andy Vinter. Singer: Christine Andreas. Orchestra: BBC Concert Orchestra. Conductor: Larry Blank. Singer: Jamie Lambert. Orchestra: BBC Concert Orchestra. Conductor: Larry Blank. Singer: Matt Ford. Singer: Ben Forster. Singer: Rob Houchen. Singer: Jamie Lambert. Choir: Guildford School of Acting Choir. Orchestra: BBC Concert Orchestra. Conductor: Larry Blank. Singer: David Bedella. Choir: Guildford School of Acting Choir. Orchestra: BBC Concert Orchestra. Conductor: Larry Blank. Singer: Samantha Bond. Singer: Alex Hanson. Orchestra: BBC Concert Orchestra. Conductor: Larry Blank. Choir: Guildford School of Acting Choir. Singer: Linzi Hately. Singer: Caroline Sheen. Singer: Alexia Khadime. Composer: Burton Lane. Orchestra: BBC Concert Orchestra. Conductor: Larry Blank. Orchestra: BBC Concert Orchestra. Conductor: Larry Blank. Singer: Matt Ford. Orchestra: BBC Concert Orchestra. Conductor: Larry Blank. Singer: Linzi Hately. Orchestra: BBC Concert Orchestra. Conductor: Larry Blank. Singer: Christine Andreas. Orchestra: BBC Concert Orchestra. Conductor: Larry Blank. Singer: Alex Hanson. Orchestra: BBC Concert Orchestra. Conductor: Larry Blank. Singer: Alexia Khadime. Orchestra: BBC Concert Orchestra. Conductor: Larry Blank. Singer: Caroline Sheen. Orchestra: BBC Concert Orchestra. Conductor: Larry Blank. Singer: Julian Ovenden. Singer: Caroline Sheen. Orchestra: BBC Concert Orchestra. Conductor: Larry Blank. Singer: Julian Ovenden. Orchestra: BBC Concert Orchestra. Conductor: Larry Blank. Singer: Liz Robertson. Orchestra: BBC Concert Orchestra. Conductor: Larry Blank. Singer: Rachel Tucker. Choir: Guildford School of Acting Choir.